BEAT the PHILLY and sugar with an electric mixer until smooth. Beat in the eggs then and stir through the coconut milk. Pour filling over the prepared base and scatter over the raspberries. Place in a baking dish and pour boiling water into dish to come half way up the side of the cheesecake pan. 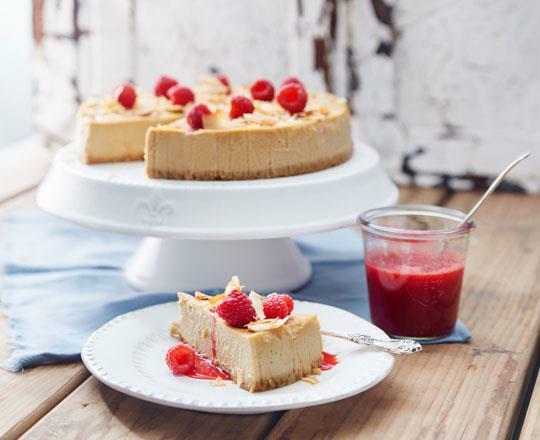 Bake the cheesecake in a moderate oven 175°C for 60-65 minutes or until just set. Cool in the oven with door ajar. Chill. DECORATE with extra berries and a serve sliced with a drizzle of sauce if desired. TIP: When lining the inside of the pan for a baked cheesecake extend the paper 3-4cm above the top of the springform pan.